High performance Gyproc partitions and lining systems have been chosen to meet demanding levels of acoustic performance throughout Muscat’s latest hotel complex. The Village Plaza Hotel is under construction at one of Oman’s most prestigious marina-front locations, The Wave Muscat, a stunning six kilometre stretch of coastline that is set to provide an outstanding new contemporary and trendy lifestyle and leisure destination in the heart of new Muscat. To provide a restful environment for guests, the client stipulated high standards of room-to-room acoustic performance. The design of the structure, however, meant that separating walls would have to accommodate a series of different sized pillars, whilst maintaining the minimum level of acoustic performance throughout. To do this required a flexible separating wall system that was capable of accommodating the pillars, but could be upgraded, as required, to meet the client’s standards. The requirement has been met using GypWall QUIET IWL, a high performance acoustic partition system that is based on twin freestanding metal frames. Where necessary, the spacing between the frames is simply increased to accommodate the pillars, and additional layers of high performance plasterboard added to meet the required standard, without any break in the wall line. It is part of a package of Gyproc lightweight separating walls, partitions and wall linings, valued at almost AED 1million, that will be used to meet acoustic, fire and durability standards throughout the multi-level structure. The lightweight systems, which are easier to manoevre within the often tight confines of the hotel rooms and corridors, are quicker and easier to complete than the traditional masonry alternatives, and will enable the project to be completed within a tighter timeframe. The Gyproc systems, including GypWall CLASSIC and GypWall QUIET partitions and GypLyner UNIVERSAL wall linings, are being installed by contractor Zubair Furnishing, and could be joined by a further AED 200,000 of Gyproc MF Ceilings once all of the final contracts are let. 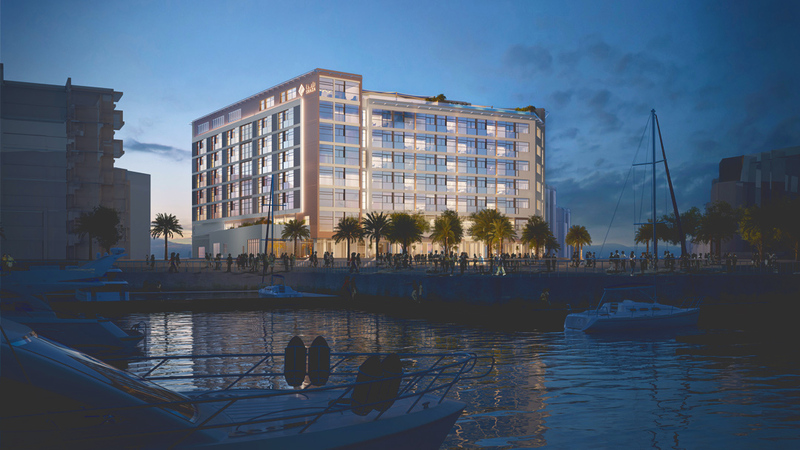 The US$64.9 million 4-star hotel is being built for operator Shaza Hotels by local Tameer Investment Group. It will provide a total of 190 hotel keys as well as a selection of suites and will be a key feature of the central plaza district, presenting residents with a complete lifestyle package, including a choice of restaurants, business facilities and even a rooftop recreation and fitness centre.